The Percussive Arts Society (PAS) is "a music service organization promoting percussion education, research, performance, and appreciation throughout the world." The Connecticut Chapter Day of Percussion was hosted by PAS chapter President Jim Royle (and owner of the Jim Royle Drum Studio), at Fairfield High School. Along with a terrific lineup of drumset artists, I was looking forward to a performance by James Walker (our own online Mallet Forum moderator) was going to be using his Xylosynth, by Wernick Musical Instruments, Inc. Here, in words, photos, audio, and video, is the scoop for those of you who could not attend. After impressive opening performances by Elementary and Middle School Percussion Ensembles, the pros took to the stage. Note: All video clips below require Windows Media Player, which is normally installed with the Windows OS or you can download a free copy here. All audio clips require the RealPlayer, which you can download for free from here. 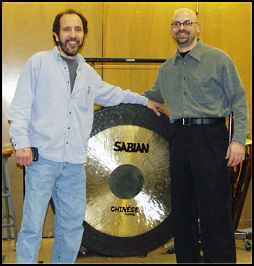 Dr. Nick Petrella is not only a professional percussionist but also the Director Of Education for Sabian, the cymbal makers. Nick's informative clinic covered his area of expertise, multiple percussion. He challenged the audience to get rid of old paradigms and think about percussion in a new light. To drive his point home, Nick performed a piece on Marimba and then pointed to the instrument and asked the audience how many instruments they saw. The correct answer? Not one, but 61 separate instruments. Nick explained that each bar should be considered a separate instrument. Various styles of music notation that today's multi-percussionist needs to be familiar with, including spatial and graphic notation. How to choose effective substitutions for instruments originally recommended for a musical piece and how concert hall acoustics affect instrument selection. Tips and tricks on multi-percussion instrument setup. Tips for constructing your own mallets to improve your performance of difficult percussion pieces. Reasons that mallet and percussion players should learn all four major grips: Cross Stick, Musser, Burton, and Independent. Musicality: Nick revealed the subtle secrets that can take the average percussionist to the expert artist level. See the sidebar on this page for more about Dr. Nick Petrella. Next up was Johnny Rabb. I first became aware of Johnny when he, using a device called the Drumometer, won the title of "World's Fastest Drummer" for the Guinness Book of World Records. Since then, he has always been on the move. He travels the world doing clinics, he has performed with artists such as Tanya Tucker and Hank Williams III, and that's just for starters. He has published his own instructional drum videos, books, and a solo CD. 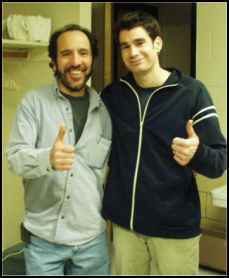 He's also the designer of The Rabb Pack cymbal set (for the Meinl company), and he invented the RhythmSaw drumstick. Johnny, along with his former partner, also shared in the design and manufacture of drumsticks and accessories sold under the name of johnnyraBB Drumsticks. However, according to Johnny, his partner decided to call it quits and the company is now out of business. But "minor" obstacles like this are nothing for Johnny because he's a man with a mission. What more can I say about Johnny? The excerpt of his performance speaks for itself. Plus, he's a great guy to boot. If you ever get the chance to catch Johnny Rabb live, don't miss him! This concert performance included talented students from Jim Royle's Drum Studio (refer to the sidebar for more info), the WSCU percussion ensemble, and Liam Teague. Liam, currently on the faculty of Northern Illinois University, is an expert in Steelpan and has been called the "Paganini of the Pan." Check out the Liam Teague Steel Drum Clinic in part 2 of this feature article for my interview with Liam. Audio Clip of Liam Teague performing with the Jim Royle Drum Studio and WSCU. Dave Smith and the Western Connecticut State University Percussion Ensemble were next up and they gave a terrific performance, with solid support from Trevor Somerville on the drumset. Click the following link for Connecticut PAS Day of Percussion 2003: Part 2!